Velvet - Yes a weird one, I don't actually just hate it I physically cannot touch it. It makes me cringe so bad. I don't know what it is but I don't want to feel it on me. Ashley even tries chasing me around shops to try and make me touch it. Onions - Yuck, eurgh, disgusting end of... I have never liked them, I can't even eat them when they are tiny mixed into food. I read the back of packaging and if it says onion, the box goes straight back down. My mums the same. Gold Fish - Ok now this will make people laugh but I am scared of goldfish, I can't even watch them on tv! When I was little I had a goldfish which died but before it died it started swimming on it's side (It's making me feel sick just writing this). It has scarred me for life, I won't even walk past them in a pet shop! If you haven't figured it out yet, im weird! Windows & Iphone Updates - If my laptop tries to do one more update when I want to do something I will throw it out of the window. Windows updates take FOREVER and are a piss take, so are Iphone Updates. Middle Lane Walkers - yes walkers... when you are walking down the street or in a super market and bam lets just stop in the middle and piss about. MOVE TO THE SIDE. It makes it worse when they give you a dirty look for trying to pass them! My Pets - We have two cats. Ebony who is 12 (a grumpy bat with attitude, like myself), Thomas who is 8 (our ginger ninja who doesn't stop moaning). We also have Peanut who is our latest addition, our spaniel... Now he is not normal at all but I couldn't be without him. Lastly Ruby who is my partners dog but I look after her alot and shes like my own, she is a 9 year old boxer who is just adorable and she loves peanut! Who Framed Roger Rabbit - If you don't know this film we can't be friends... jokes. It is my favourite film, ever since I was little. If I'm ill, sad, happy... any mood I will watch this film. It just takes me to my happy place. Theme Parks - now this is a weird one because im scared of heights. Put me on top of a cliff, I will be beyond panicking and scared and cry but theme park rides I love. I never used to though. My partner made me go on them and I hated it at first but now I love them. I *** myself every time before I go on one but once on I love it. It is just that adrenaline rush. Tattoo's - So far I have 3. I have some wonder wall song lyrics across the bottom of my stomach with a music note at the end (the song means alot to me for personal reasons), I have a lily with a pattern on my wrist then I have a bird above my ankle. I think I want around another 3-4! Gel Nails - I couldn't be without my gel nails. Luckily I taught myself how to do gel nails with extensions. I have been doing them around 7 years now and it saves me a fortune!! 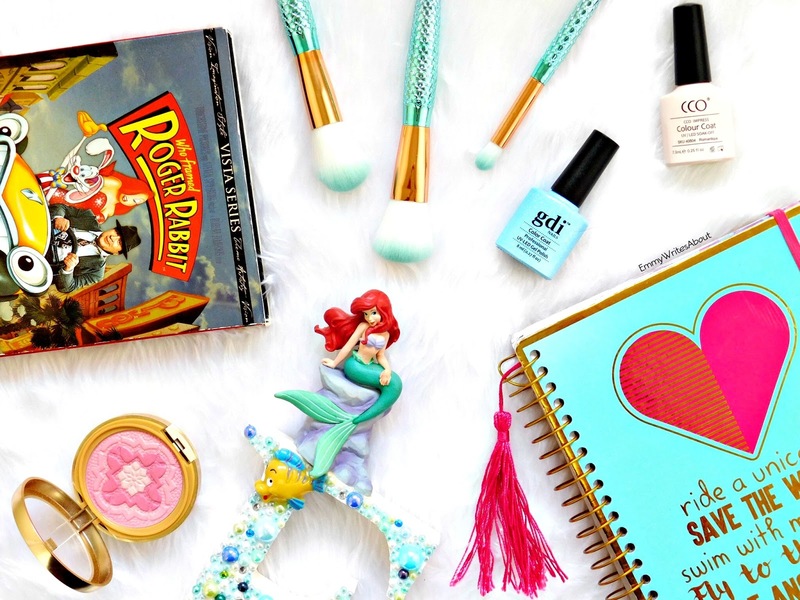 Disney - Ever since I was little I was always obsessed with Disney especially The Little Mermaid. Even now I still love it. It kind of takes me back to my happy place, when you were a kid and Disney takes you into a world of it's own.